Within Burkhart’s Jane Austin Space Opera world she has three novels, two of them in the Doctor Wyre series with one standalone. I read the first book in this series, Lady Doctor Wyre back in 2011 when it was published. I found it intriguing but I wasn’t sure if I liked it at the time. However, I found myself thinking about the world, the characters, and the technology mix for quite a while afterward. So much that when I saw this installment wasn’t just in the Jane Austin Space Austin but returned to the characters from the first story I had to request it. 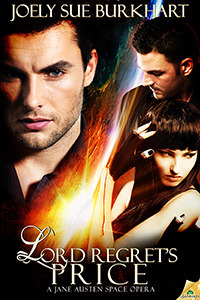 Lord Regret’s Price focuses on the emotional connection between Charlotte, Sig, and Gil with a backdrop set against Queen Majel and Britannia’s neverending quest to brutally take over the entire galaxy. Sig was haunted by his past and fears that Charlotte would reject him when he continued with his livelihood as an assassin. He was also petrified at the thought of having a flashback and hurting or killing Charlotte during an intense scene or he would find out he preferred to dominate to the extent of abusing his partner. As a result, he was withdrawing emotionally and jonesing for a new contract. In the middle of this, Charlotte was dealing with assassination attempts and all three were drawn into the tangled politics of Zijin. Charlotte was an excellent scientist and healer. Unfortunately she was so caught up in the thrill of discovery and the benefits of her invention she never considered they could be used to harm people or other species. Ever since she discovered how Britannia’s government had perverted her discovery and used it to harm, she wanted to make amends – provided she was able to continue evading the Queen’s assassins. After narrowly surviving an assassination attempt they were invited to visit Zijin’s Emperor. It was there that the politics really began. I enjoyed how each person had a piece of the ultimate puzzle and it took all of them working together to attempt to survive. In addition to cryptic conversations and long held secrets, watching Charlotte, Sig, and Gil start to work through some of their issues was very touching if nerve-wracking. When I learned about Sig’s past and saw his reaction to a certain phone call I thought my heart was going to break for him. I loved watching Charlotte try to figure out exactly what was bothering Sig and how she could break through to him. I also thought Sig’s attempts at control, his fears, and what he was willing to do for the woman he loved was an intense combination. I also saw some hints that the two men might start getting along better which would be lovely to see. Lord Regret’s Price explored a variety of different situations and fears. So far both Charlotte and Sig have had to face some of their darkest fears but Gil hasn’t had to admit he even has any. Burkhart has made some very interesting world-building expansions, which have heightened what Charlotte and her men have at stake. I really enjoyed how Charlotte’s scientific mind has been hard at work figuring out how to counteract the harm done by Queen Majel. I also loved how Charlotte gave up some of her control and actually showed both Gil and Sig more than she ever showed them in the past. I am very curious about what the Queen’s next moves will be as Charlotte continues to consolidate her power base. I am looking forward to the next installment in the Lady Wyre series.